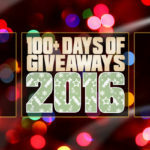 Home / Giveaway / A Freeze in mid-May? No Way! Here in Iowa it is generally accepted that the last freeze day each year occurs on May 15. After that date there should be no nights where the temperature drops below 32 degrees or any hard frosts occur. Or so I thought. In actuality the May 15 date means there is only a 10% chance of a freeze after that date according to the Iowa State University’s Department of Horticulture. This year we rolled snake-eyes and were warned of an impending frost on the night of the 16th. We had just finished planting all of our tomato and pepper plants the prior week, and our onions and lettuce have already begun sprouting. It looked like it all would be lost. We didn’t get the warning until watching the 10 o’clock local news, so it was already pitch black outside. Of course the gardens are in an area where the porch light doesn’t even come close to illuminating. Our only hope is to get outside and cover the plants with towels so the frost wouldn’t land on them. Last June we told you about a headlight solution from Energizer, but who knows where it is now. 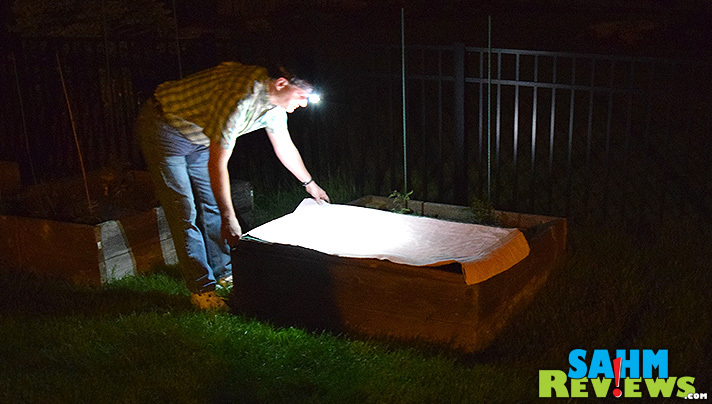 Holding a regular flashlight while you’re trying to gently spread coverings over delicate plants was not an option. 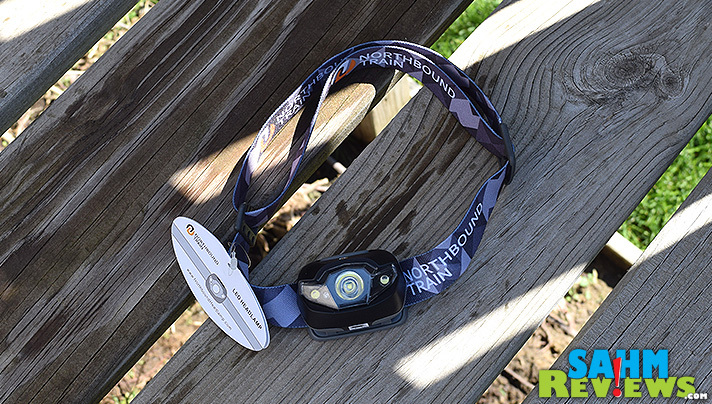 Fortunately we had recently received a new headlamp from Northbound Train. Talk about great timing! 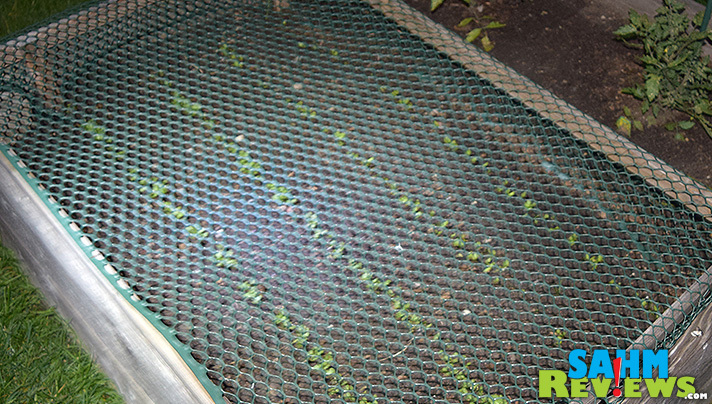 As you can plainly see, our lettuce is young and hardly larger than a clover. But losing them would means 2-3 weeks of delay and probably much less yield if we get a hot spell. One drawback to all headlamps (in my opinion) is you can look silly wearing them. Like this aptly-named version from Northbound Train, you look a lot like a train conductor or even an oncoming train. Hubby wasn’t amused by this revelation. Nor was he by the fact we were ‘gardening’ at 11 o’clock at night. But since he had a headlight on, covering the lettuce (and the other plants) only took a few minutes. I’m sure it would have been quicker had I helped and not been focused on documenting the ordeal! The strap is attached in a manner that doubles as a cushion against your forehead. Not only does it have two light settings, along with a red ‘night vision’, you can dim it by holding down the button, giving you unlimited brightness settings! THEY INCLUDE BATTERIES! And not some cheap-o Chinese batteries. Brand new Energizer AAA batteries! Three of them! Price – it actually comes in a bit cheaper than the Energizer brand retails for at Walmart. And for a limited time with this custom coupon code ( SAHMDEAL ), you can save an additional 30% at Amazon! Father’s Day is just around the corner and there is plenty of time to pick one up for him! Perfect for camping, hiking, fishing or any around-the-house repair work. Best of all, it is backed by a Lifetime Guarantee! 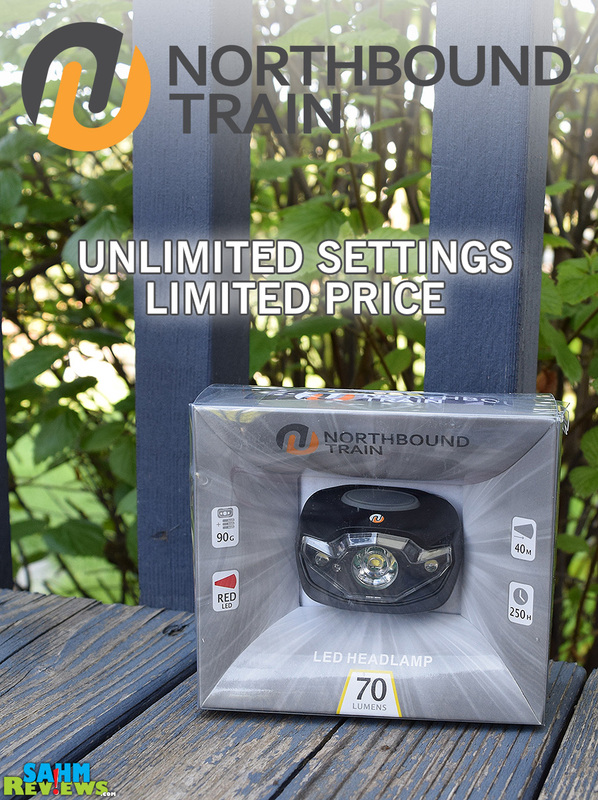 Want to learn more about Northbound Train and their upcoming products? Pay their website a visit and follow them on their social media pages: Facebook, Twitter, Pinterest, Tumblr and Google. You can win one for yourself right here on SahmReviews! Great timing – hope you were able to save the plants! Thanks for sharing. Handy device, that! Haven’t used my lighted headgear for gardening yet, but it’s a great idea for those days when it feels like there just aren’t enough hours of daylight! I got my boys headband head flashlights at home depot last year for Christmas and they use them at night to read! I need one of those for my husband when he barbecues after dusk! I like a head lamp while camping. I like to sit around the campfire reading and then when a conversation interest me, I like to look up from my book and stare at the person I want to talk to, thus blinding them with my light, and put in my 2 cents worth.Then I go back to reading my book. Needless to say this makes me the most popular camper in my group of friends an ensures many group camping invitations. Ha ha! Great name for it! Sounds like a really great, practical headlamp. This LED headlamp would be great for when I walk my dogs in the dark. Not only would it help illuminate the sidewalk in front of us, it would make finding and picking up their poop in the dark so much easier. Thank you for giving me this great idea for a new purchase. This is really nice. I know my hubby would love a new headlamp. I will have to check it out. Thanks for sharing. A headlamp is so practical! Bet this would make a great Father’s Day gift! This looks incredibly useful for someone like my dad. He’s always working on projects and trying new things. My daughter always keeps headlamps in her car in case of emergency. This one looks like a great option for her, since she is looking to replace one that broke! These always make me think of miners, I never really thought about useful that this would be gardeners as well, great idea! There are so many uses for this at my house! This headlamp is a good idea. So many jobs need two hands so this light on the head that will go wherever you look is a great idea. Anyone laughing would fall in line quickly when they realize he’s the only source of light in the dark! This is a seriously good idea. We often end up doing garden chores, etc. well into the evening hours, and my husband would really use this! You know, I could really use one of these. It would allow me to work outside at night once the children are asleep! I can’t believe how bright that is. So handy. This looks great, I so could use one for our camping trip! that lamp looks perfect for camping! I camp with Cubs and Scouts, so having this handy headlamp would be great for keeping my hands free to help little campers. This would be helpful when I take the dog out to go potty at night. Now I want one! I know my hubby would love a new headlamp. Oh my goodness! My husband always works outside on his motorcycles in the dark because it’s pretty late when he gets home. So this would be really great for him! Love the title and handy device. Thanks for the review. It’s a consideration for my brother in law. Dad would need something else. Thank you. Not crazy about the frost or the midnight gardening either, but it would go so much easier with this light. 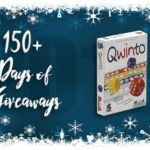 Thanks for your post, review, and opportunity to win one! Cool review, and nifty product for doing work in the dark. Would consider using it here in the jungles at night lol. Everyone needs one for camping. 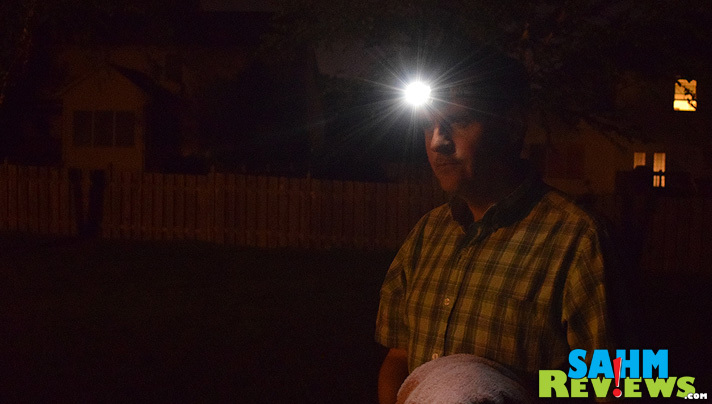 Our power goes out more often than it should, and I’d love a headlamp to make reading, walking around the house, and just about everything easier in the dark. During Winter, I’ll use it to walk my dog after it gets dark at 4pm. 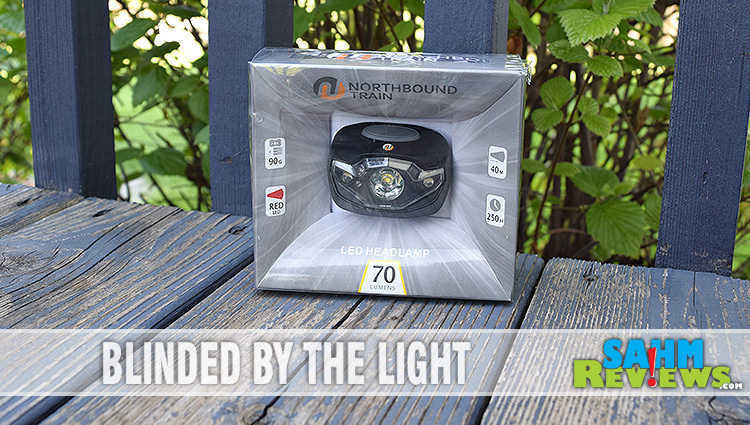 I would love to win this awesome headlamp for my dad, and he would use it when working at backyard! I would gift this to my brother, husband or Dad to use at night for surf fishing. I use a headlamp to go rock hounding. This is a nice looking lamp. I think that I could use it when I go hiking at night. These head lamps are really nice. My son and husband both have a pair they love. Love headlamps. I’ve got one for work and it’s perfect for all the reasons you describe. I’m not a camper but this headlamp has so many uses other than that, as you so clearly demonstrated! We love ours! Our weather gets crazy like yours! There are times that the weather man is way off and we’re right! We don’t garden anymore, but my husband does still fish and my family loves camping. Of course, we still have a battery operated lamp, but this looks like a good dependable light! I’ve never heard of the Northbound Train brand, but I will look into it.